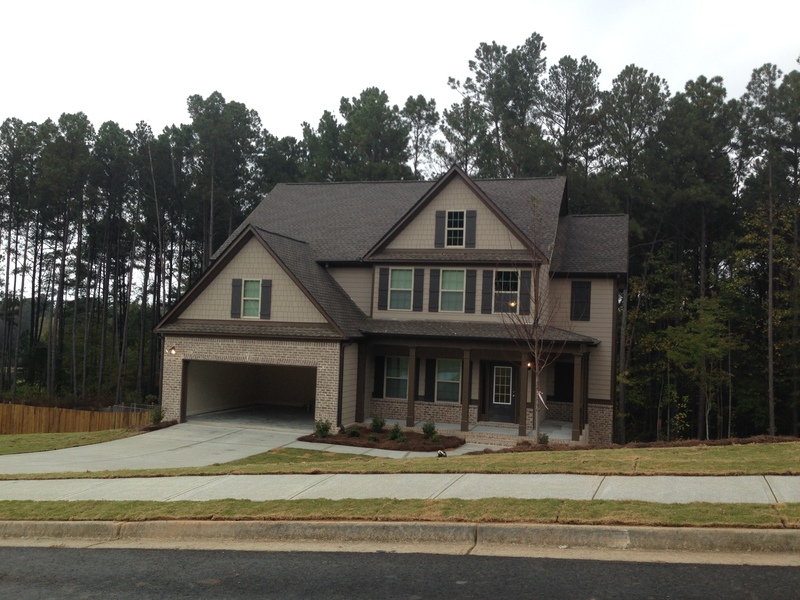 I’m excited to say that yesterday we closed on our new home. The next few weeks will be full of moving and unpacking. I will be reposting the “best of” my old blog for the next couple of weeks. Tacking Strip- we used four rolls of Deitz home for our project. 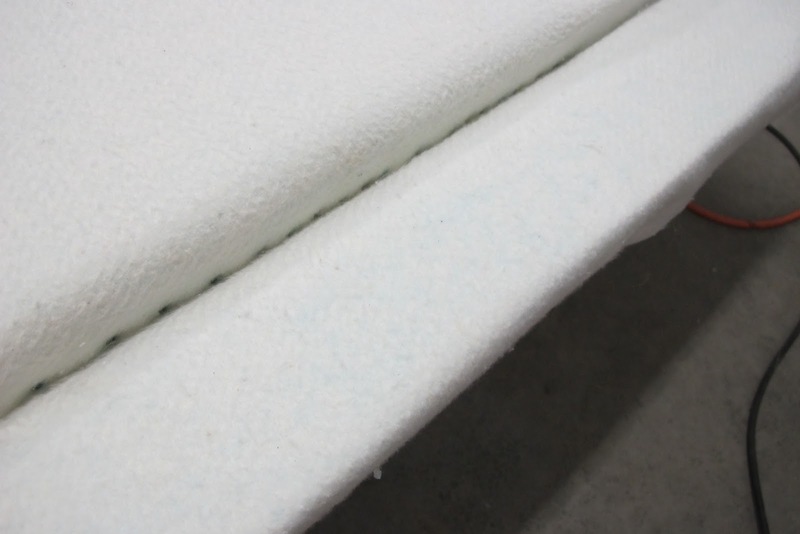 1″ Heavy Duty Foam for the border of your headboard. Ours was 4″ Wide all the way around. Batting to cover and smooth your foam. We used Warm and Natural- it was perfect! Fabric to the size needed. We bought 3 yards because we intended to make legs. 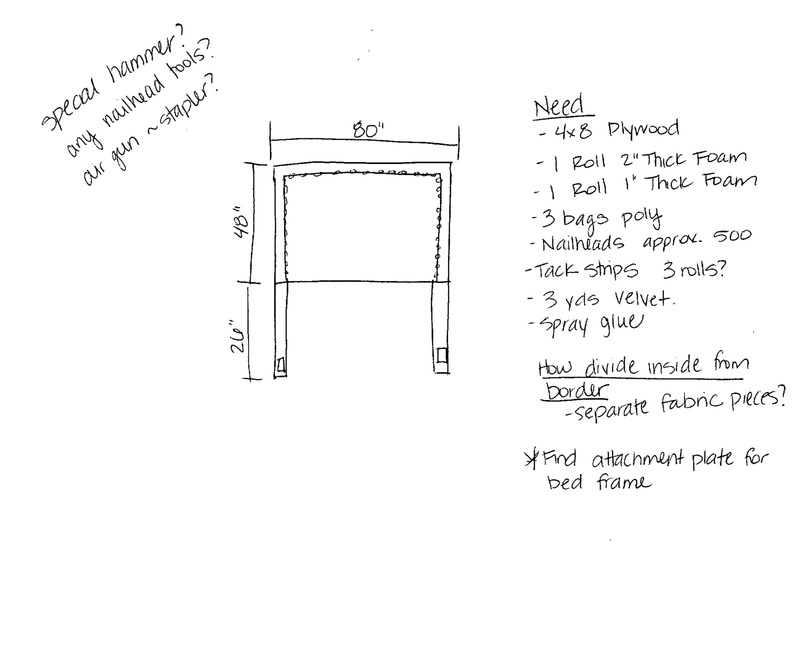 We ended up not making legs and could have used 2.5 yards. 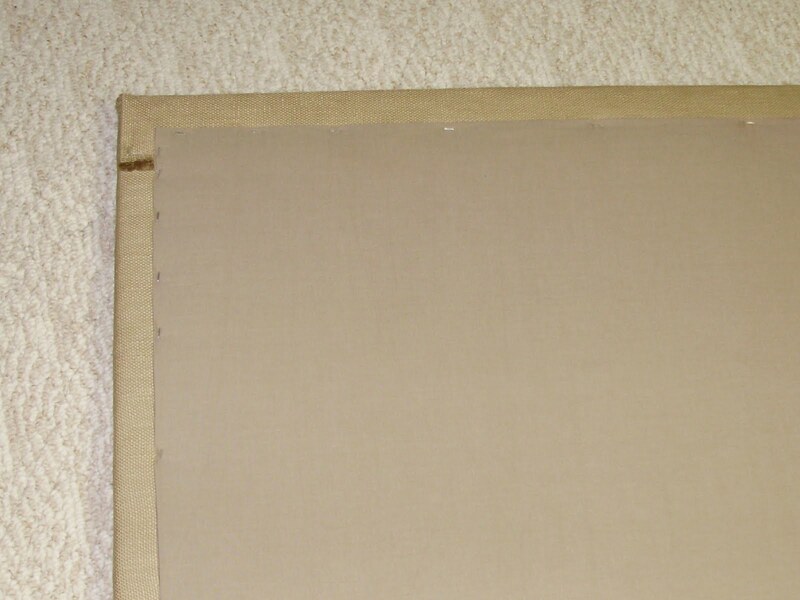 Nailheads– we used brushed nickel 3/16″ nailheads from here. 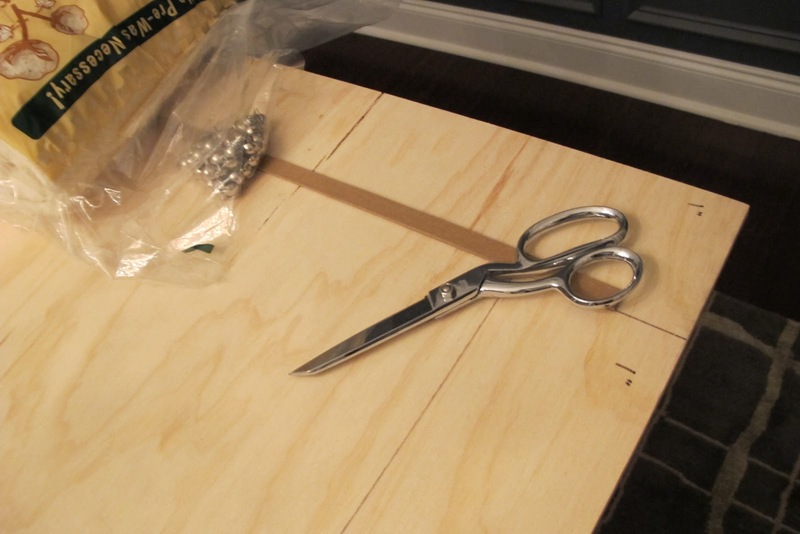 We opted not to use the trim kits because they didn’t look as nice– but are in hindsight, probably MUCH easier! 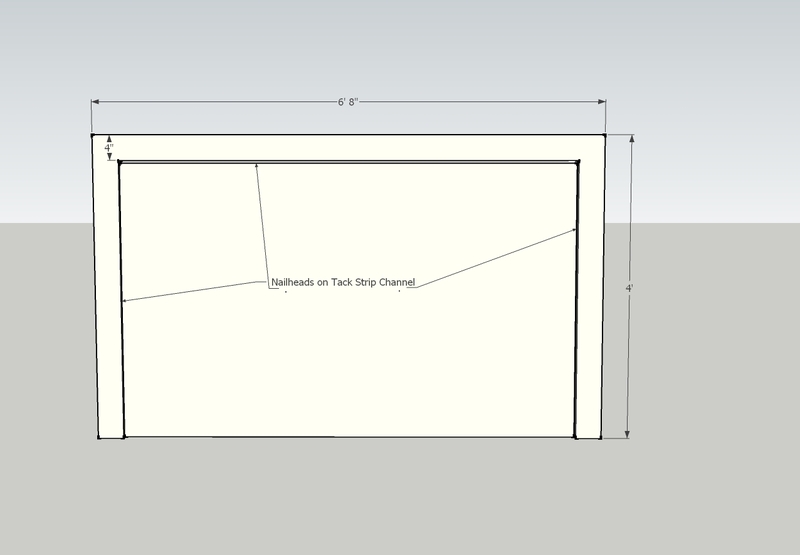 T-Square for measuring. 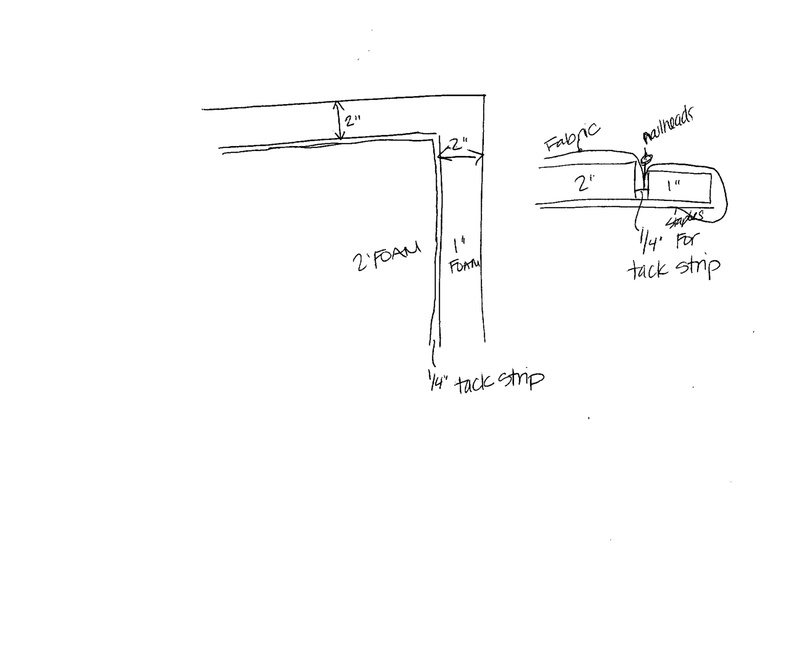 Not necessary- but VERY helpful when measuring the foam and plywood board. How To Create Your Masterpiece. Before any work begins- plan out your design on paper. Get an idea of materials that you need and come up with any problems you might encounter. If you use our design- we worked out all the kinks before we made ours and other than the fabric mishap- it went easy! 1. 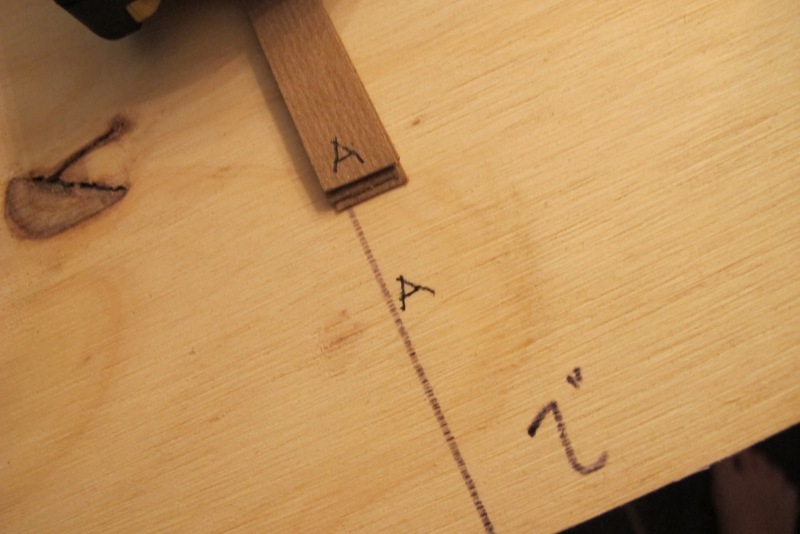 Draw out your design on the plywood and cut to size. 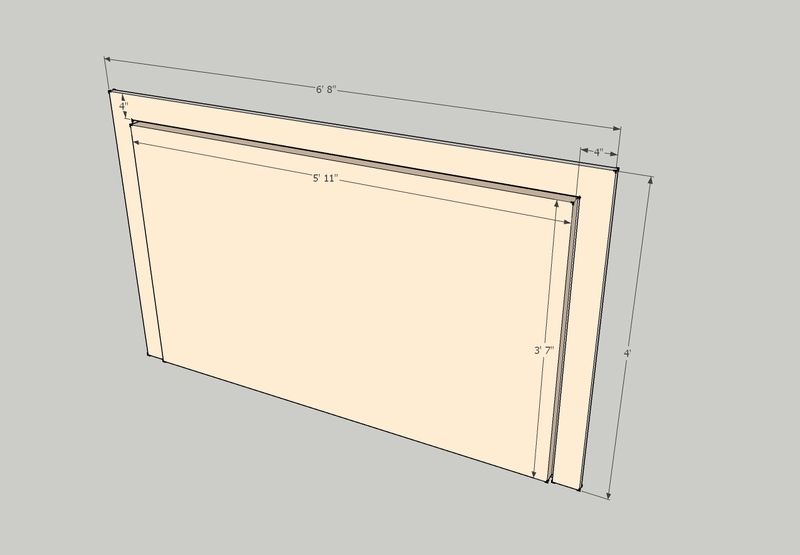 We had a 4″ border all the way around the headboard. 2. Mark any notes to help you remember what goes where (I marked what was 2″ and 1″ Foam. I also labeled sides. 3. Cut strips of the tacking strips to go between the border and the center foam. Glue layers together until the desired thickness needed. This is used as a base for the nailheads. Make sure to make it thick enough so that the nailheads don’t go all the way through the plywood. We used 14 layers for ours. I marked each line and it’s matching tack strip to help me not get confused! 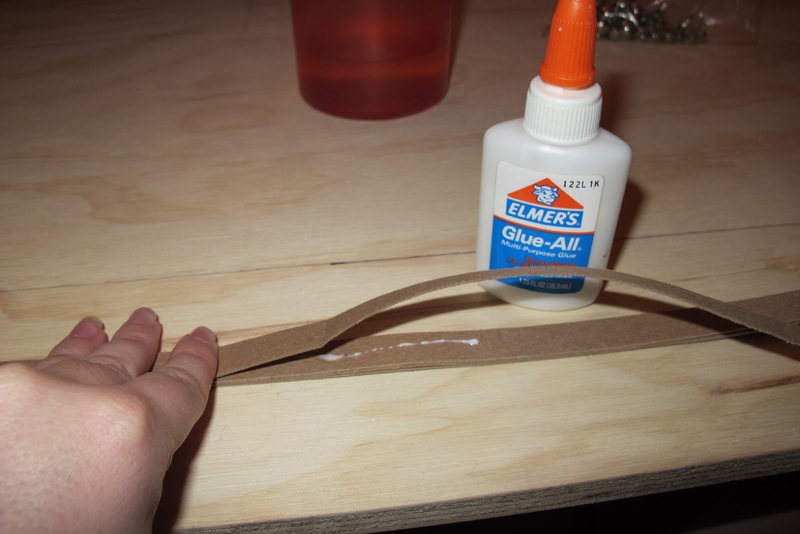 Once all layers and strips are made, glue them to the plywood on their corresponding line. 4. 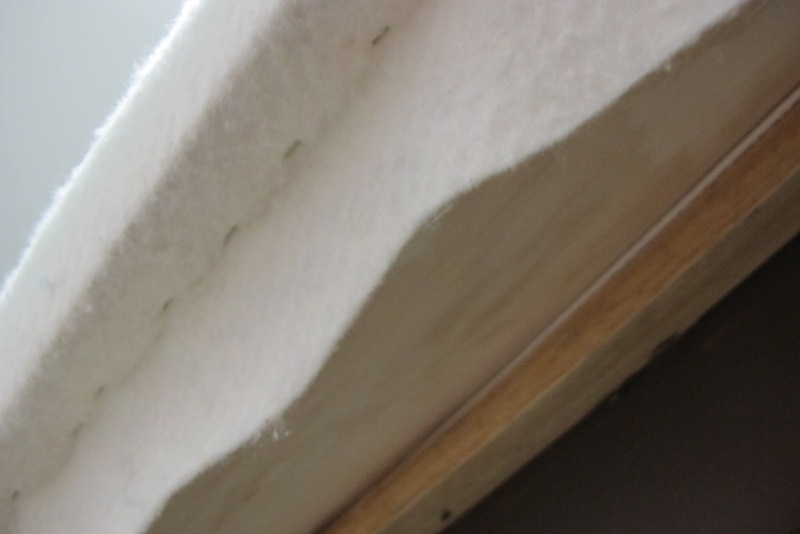 Lay foam out and cut to needed size.We cut to the edge of the tack strip. In hindsight, if there was a little overlapping on the strip- I wouldn’t think that was a bad thing.We cut the center first and then the border. We always put manufactured edges out and up and our cut sides to the inside or bottom. 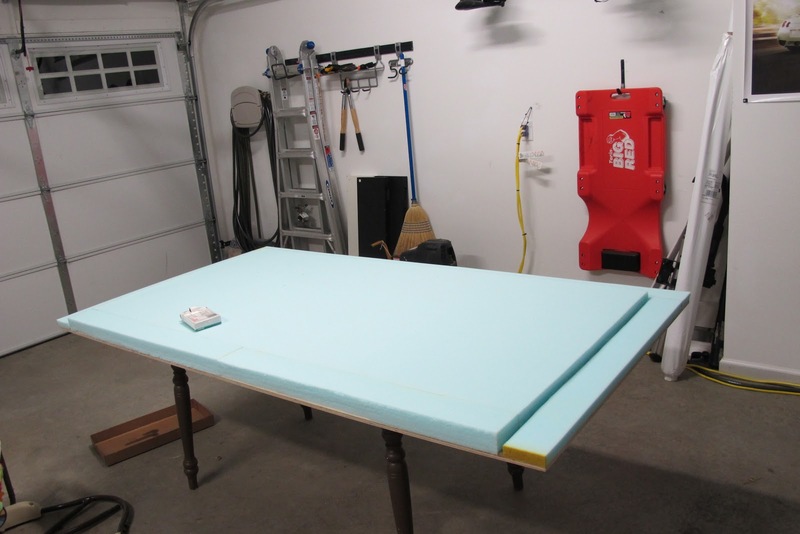 5.Spray the plywood and the foam with the spray adhesive and let sit for a minute (as directed by the can) and then place foam on plywood and press down. 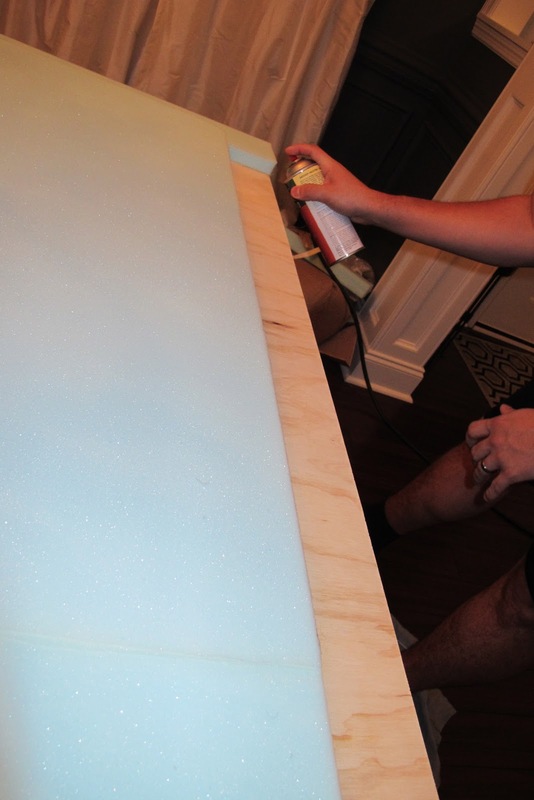 Make sure to get all the pieces of foam as close together as possible to avoid gaps and creasing! 6. 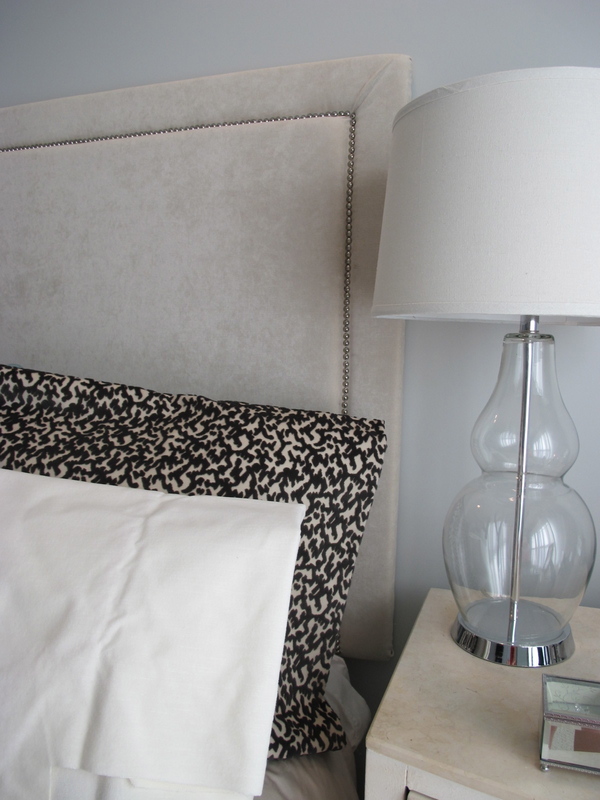 Layout the batting across the headboard and smooth out– the smoother this step goes- the smoother the fabric will lay. 7. 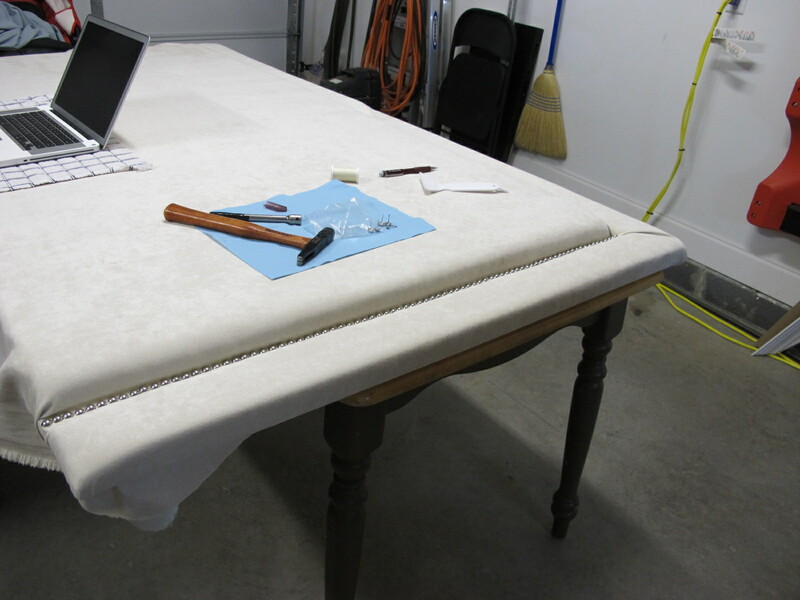 Use staple gun to attach batting to the tacking strip, pulling tightly to avoid sagging. This will also give you a channel for your nailheads to go. Go ahead and staple the batting to the back. Make sure to work the batting in the corner to get a clean edge. 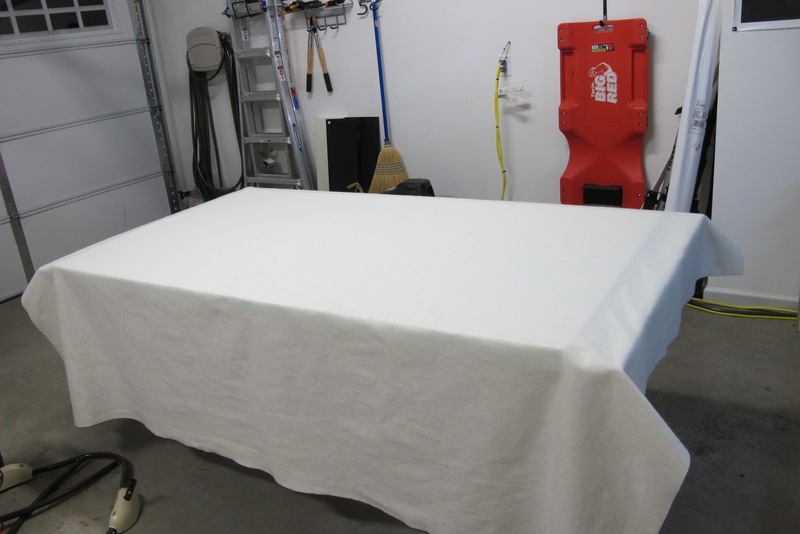 8.Because the batting is holding the shape together and gives your fabric something to grip to, you can lay your fabric out and get it as straight as possible on the fabric. 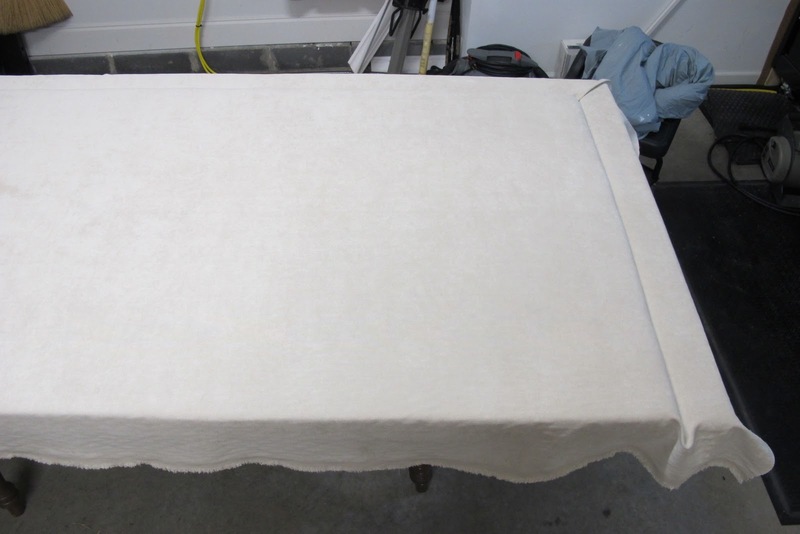 9.Wrap the fabric around the border and then staple on the back. I started at the corners and got them smooth and folded and then worked outwards. Make sure to pull the fabric consistently so that you don’t get dips where you pulled too tight- but make sure that it is taught and won’t sag over time. 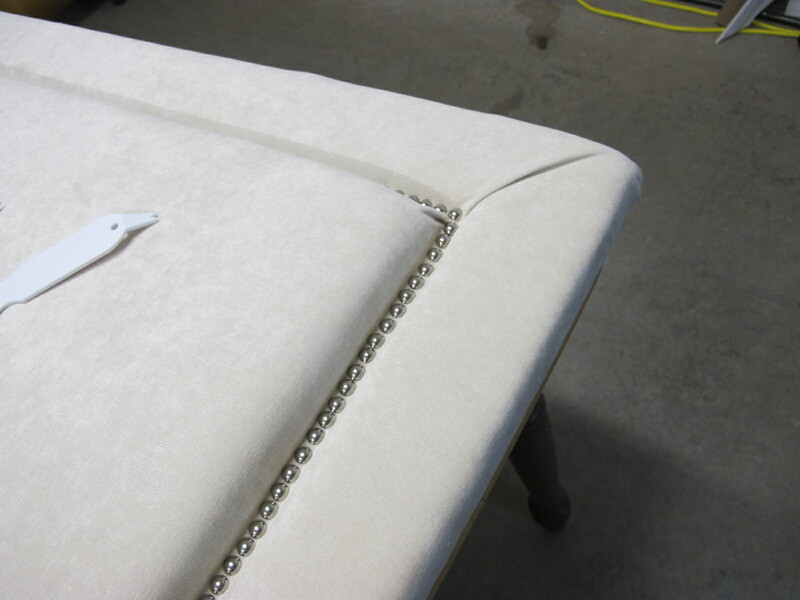 10.Using your nailhead spacer, begin in the corner and slowly take your time nailing in your nailheads down the sides and across the top. Because your channel is about twice the size of your nailhead, it is easy to center the nailheads. As long as your tack strip was straight, so will be your nailheads! 11.You can cover the backs of the headboard- but we decided against it since we ended up just attaching the headboard to the wall as this one blogger did. 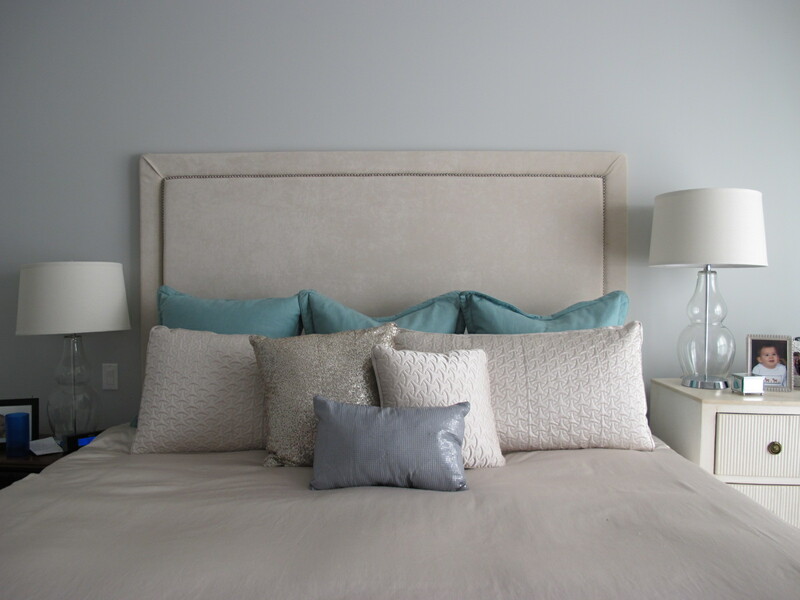 Our original plan was to attach the headboard to the bed frame with legs, but after working through the process, we decided because of the height and weight of the headboard that it needed to be wall mounted. 12. We bought two 18″ wall brackets for it. 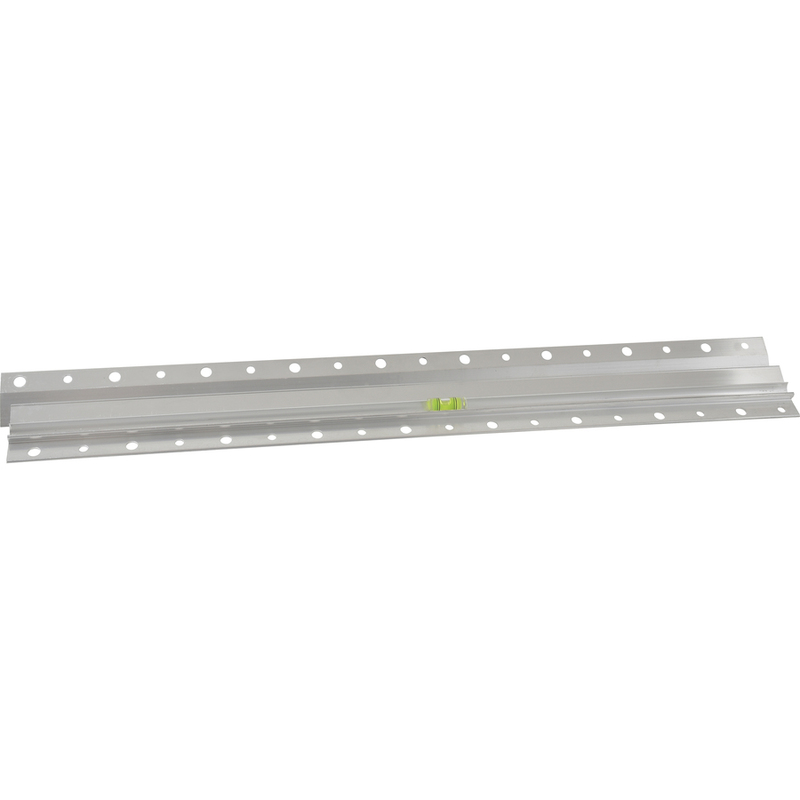 Greg found studs that he could screw into and then mounted the wall bracket. 13.With and easy lift and sitting the headboard on the bracket, a bit of adjusting left and right- we were done! Although a long and intense project it is so worth it! I found a couple of companies to make this for me and was quoted $1500-2200 for just the headboard. We were able to make ours for just around $300. Well worth the save if you ask me!